Daniel Nieto from Chile, Danieto aka ADN & Skipsapiens (together with Pier Bucci), started at the end of 90´s to produce his own music, influenced by the english intelligent techno scene. His first productions came out in the label Ojo de Apolo (Chile) under the name of ADN, where he released his album "Granel", the EP "Hormiga" (both in 2000). Also on this label, he participated with two tracks on two different compilations: "Coda 05" (2000) and "Coda 09" (2002). On 2001, with the name Skipsapiens he edited a same called album under the belgian label U-cover, and recently a limited series of 95 CD-R called "Evolución al Origen" (2004) which gathers his best seven tracks produced between 1999 and 2003, where you can hear a more analogic but truly updated sound. He also remixed a Process track called "Serial Algorithm of Genetic Mutations", appearing at the compilation	"RE´Processed, Interkontinentale Remixes" (2002) in the german label Traum, and another remix of Ontayso, included in the compilation "Re-mixed, Re-worked, Re-constructed and Re-invented Part One" (U-Cover, 2002). 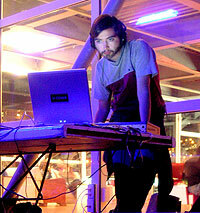 In 2004, together with Claudio Cisterna, as part of the fondart project (supported by the government of Chile), he founded the netlabel www.impar.cl, where he has 3 productions, full of rythmic and warm experimentations. In 2005 launches his first LP on the belgian label U-Cover, called "Cirugía Casual" and together with Pier Bucci	the record "Skipsapiens-eco" with the label Mutek.rec. Also he remixes the track "Compacto" (pn003) of Hans Carstens	for Pueblo Nuevo. On this period the perform varied shows in Guadalajara, Mexico DF, Montreal, Valparaiso,... all of them under the mutek label. Follow his new surprises at www.impar.cl, Pueblo Nuevo (Agranelado), and his two recent records under U-cover	"Contemplación de la vida Inerte" and "Danieto + Flipper".